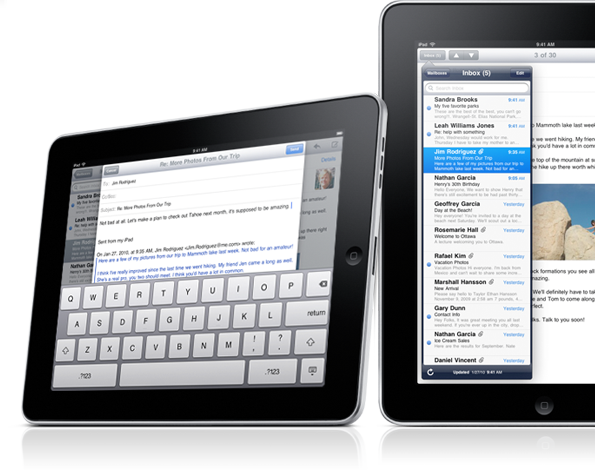 Built into the iPad is the usual iPhone email application. Mentioned previously though is that this is one application that really needed a bigger screen. Day to day, the iPhone email is very usable but it can be so much more if you could expand your view to a larger screen. Then, add the full size on-screen keyboard and suddenly your knocking real emails out. Organizing the incoming all on one screen. This is definitely one of the Plus items for the larger screen. All the usual email account types are still covered.